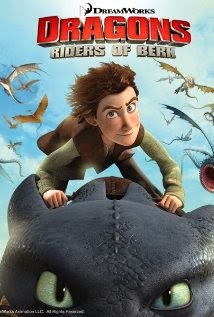 It's not a surprise that the popular How To Train Your Dragon films and subsequent TV show Riders of Berk have spawned a comic book. The movie featured a young Viking boy named Hiccup who befriends a dragon, the ancestral enemies of his people. Eventually, he manages to fix the dragon's wing and ride him as he comes to understand that the dragons are enslaved by a master dragon; Vikings and dragons team up at the end in a film filled with wit both charming and vulgar. The first volume of this new comic series, Dragon Down, was written by Simon Furman and drawn by Iwan Nazif. There's an inherent problem both with the TV show and this comic, which is that the original premise of the first film (Vikings vs dragons) was a huge part of its appeal. The new status quo of dragons living with Vikings is such that new conflicts have to be manufactured that are inevitably less engaging than the original premise. For example, in this book, the antagonists are a group of outcast vikings who use a runaway dragon as bait to trap Hiccup and force him to train dragons for them. These characters are little more than ciphers. The misunderstanding that leads to the dragon of one of Hiccup's friends running away is far more interesting as a conflict, and it's what really drives the story. The rest feels like obligatory action. This is not helped by the wooden dialogue that lacks the snap the film and TV show carry. Losing the solid voice work from film does a lot to blunt the comedic and dramatic impact of the characters, leading to an adaptation that feels forced. That's especially true of the attempts at jokes and some of the initial character interaction; it's as though Furman felt obligated to do some minimal level of introduction for the reader that revealed something about the characters, only his attempt was so surface that it was hard to tell the difference between most of the characters. The character relationships which were so sharply detailed in the original film are mostly shunted to the side in the comic. On the other hand, Nazif's linework is excellent. He had the imperative to stay within a certain set of designs in order to be consistent with the look and feel of the cartoon, but his art is lively and fluid. That fluidity makes what is otherwise a dull story readable. I'd love to see him turned loose on something other than corporate art, because his talent for comedy, adventure and simple motion on the page is obvious. I do commend the publisher (Titan Books) for not forcing him to draw in the same 3D style as depicted on the cover; instead, the coloring and format is such that it plays to his strengths as a stylist. In order for this series to succeed on its own, there has to be a deeper exploration of individual characters that's only hinted at here; otherwise, it will simply pale in comparison to the source material.